Tbilisi, DFWatch – The Agricultural University got its authorization back on March 26, two weeks after it was suspended by the authorization commission. The university is now allowed to carry on with all its 25 accredited programs. Students and personnel of the university celebrated the decision, but will are still waiting to see a written and published document about the decision, which was announced on March 26, after the commission had been meeting for an hour and a half. The commission explained its decision saying that the faults had been corrected, but also pointed to the high public interest towards the specializations which the Agricultural University offers. Many of the subjects are not taught at any other universities. But the commission also emphasized that it will use its authority to monitor ongoing processes at the university in order to make sure that all the faults indeed have been corrected, representatives said. The Agricultural University was promised that the new authorization will go into force as soon as the decision of March 12, to suspend it, is abolished. While the Authorization Commission was deliberating, students of the Agricultural University organized a sixth protest rally outside the Education Ministry to wait for the decision and protest against the decision to suspend authorization two weeks ago. The students prepared two songs with special lyrics for the protest and sang them for about two hours outside the building on a blocked road. 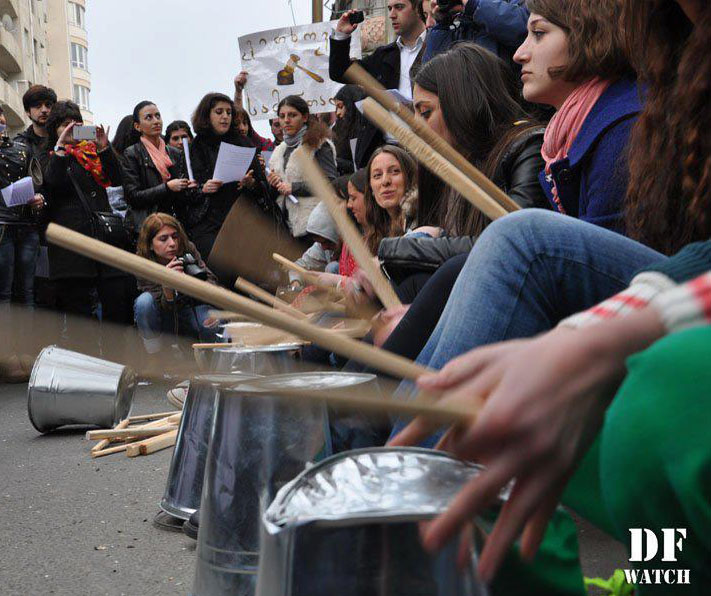 “We don’t need your authorizations, we don’t need no though control,” students were singing, while some of them brought sticks and metal buckets to make some noise outside the ministry. When the results of the commission session became known, the students celebrated. The issue of suspending the accreditation of the Agricultural University was seen as politically motivated by many people, because the university is owned by the businessman and Saakashvili supporter Kakha Bendukidze, who was economy minister some years ago. On the other hand, the education minister and other government officials accused former government officials of politicizing the issue and claimed that Bendukidze was engaging in PR in order to portray himself as politically persecuted.